Painted stalks depicting refuge drives point home. The idea of leaving refuge which does not have Bt traits, while extremely important, has been confusing from the start. By now most people still using the 80%/20% refuge system have figured out the configuration that meets requirements and works best for them. And if you’re ignoring the refuge requirements, you’re not following the label or the law, taking a big risk should you be discovered, and possibly contributing to the potential development of resistance. Original Smart Stax refuge- Notice the orange plants in the corner representing refuge. They make up 5% of the total plot. Dow AgroSciences researchers recently demonstrated on one of their test plot farms near Noblesville, Ind., how the new Refuge-in-a-Bag powered by Smart Stax, their new product which was approved and planted on very limited acreage this year, can simplify planting without affecting yields. Instead of needing to keep inventory of two types of seed for a particular field, you only have one type of seed, with the refuge distributed evenly throughout the bag. The technology Dow AgroSciences uses to do that is proprietary. 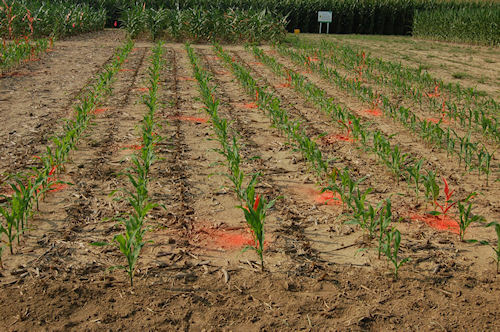 The demonstration consisted of a number of 8-row corn plots. One included orange plants which made up 5%of the total, to represent the refuge requirement if you’re using original Smart Stax that does not include the refuge within the bag. 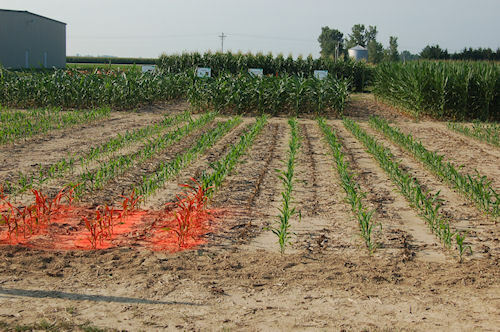 Another plot had orange plants representing 5%, but scattered throughout the field to show what pattern you can expect from planting the new Refuge-in-a-Bag product. The third plot didn’t have any plants that were painted orange. The point, Dow AgroSciences spokespersons say, is that it’s the same plot as the one with the 5% marked and scattered, but the refuge plants were left unmarked for a reason. They wanted to see if people could pick them out on their own. Instead, all the corn looked even. It indicated how well the company has tried to match the Bt hybrid with a refuge hybrid for agronomic traits. There were no apparent differences in height, emergence, or leaf type at this stage in the game. The plots were planted in late July for demonstration purposes. Take a closer look at the pictures. They tell the story.